The self-immolation on Dec. 17, 2010 of an obscure Tunisian, Mohammed Bouazizi, set off a political firestorm across the Middle East that has yet to subside. His story as first told contained some inaccuracies; so now, with facts and his legacy more established, it’s useful to review how the regional upheaval began. 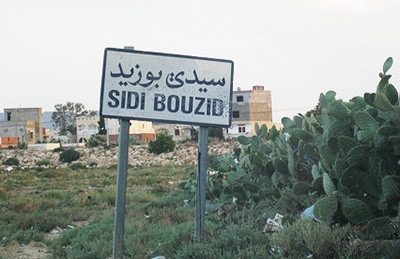 Sidi Bouzid, a town in central Tunisia with a population of 40,000 and no special distinction (other than lending its name to the nearby World War II "Battle of Sidi Bouzid" between German and U.S. forces) served as the unlikely venue for the drama. Sidi Bouzid is off the beaten track. There, as throughout Tunisia during the era of Zine El Abidine Ben Ali, the police lorded it over civilians. In particular, they treated the produce market, where Mohammed Bouazizi sold fruit, in Fisher’s colorful description, "as their personal picnic grounds, taking bagfuls of fruit without so much as a nod toward payment. The cops took visible pleasure in subjecting the vendors to one indignity after another — fining them, confiscating their scales, even ordering them to carry their stolen fruit to the cops’ cars." Twenty-six years old, unmarried, and the main provider for a fatherless family of eight, Bouazizi suffered from these predations. On the fateful day of Dec. 17, he dragged his unlicensed wooden fruit cart loaded with produce as usual to the market at 10 a.m. Two police officers along the way – one of them Fadiya Hamdi (also spelled Fedya Hamdi), female, age 36 and an 11-year force veteran – began helping themselves to his fruits. 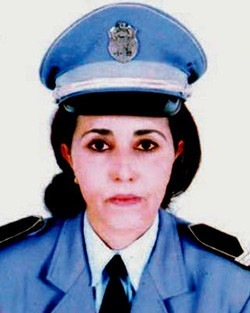 Officer Fadiya Hamdi provoked Bouazizi. Bouazizi’s uncle intervened on his behalf, getting the officers to leave off. The uncle then went to the police chief and requested him to tell the officers to leave Bouazizi be. The chief agreed, called Hamdi in, reprimanded her, and instructed her not to harass the young man. Officer Hamdi, infuriated, went to the fruit market and went for Bouazizi. She took a basket of apples from him and deposited it in her car. As she returned for more fruit, Bouazizi tried to block her but according to Ala al-Din al-Badri, who worked a stall near Bouazizi, "She pushed Mohammed and hit him with her baton." In a rage now, Hamdi, reached to take Bouazizi’s scale and when he again intervened, Hamdi and two other officers threw Bouazizi on the ground. They took more produce and his scale. Bouazizi wept and pleaded. "Why are you doing this to me? I’m a simple person, and I just want to work." Then, as about 50 people in the market watched, came the act that set off a conflagration across the Middle East: Hamdi slapped Bouazizi on the face. Humiliated, Bouazizi went to city hall in Sidi Bouzid to find an official to complain. No, he was told: Everyone is in meetings. Go home. Forget it. Rather than let the matter go, however, he went to his fellow vendors and announced his intent to protest the injustice and corruption by setting himself on fire. True to his word, he doused himself with an inflammable liquid at 11:30 a.m., applied a match, and burst into flames. 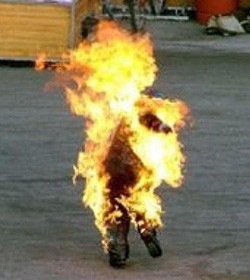 Bouazizi set himself on fire. Attempts to rescue him with a non-working fire extinguisher failed. A call to the police, predictably, got no response. Finally, after an hour and a half, an ambulance arrived. 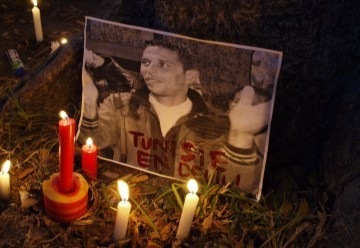 Bouazizi initially survived the ordeal and was eventually transferred to a burn hospital near Tunis. Rioting followed in Sidi Bouzid; captured on videos and uploaded to Facebook, it prompted further disturbances locally and then nationally. Officer Hamdi was arrested. President Ben Ali visited the heavily burnt Bouazizi in the hospital on Dec. 28 and received his family in the presidential office. 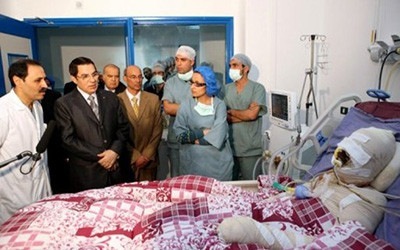 President Ben Ali felt compelled to visit Bouazizi in the hospital. 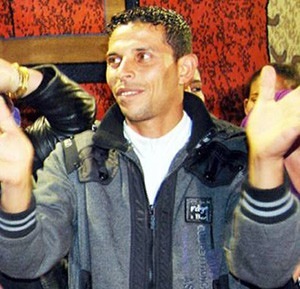 Bouazizi died of his burns on Jan. 4. His funeral near Sidi Bouzid attracted a huge crowd of some 5,000 who chanted, "Farewell, Mohammed, we will avenge you. We weep for you today, we will make those who caused your death weep." His tomb became a place of pilgrimage. Indeed, Mohammed Bouazizi was duly avenged. His act of despair has already led to the overthrow of two tyrants (in Tunisia, Egypt), precipitated two civil wars (in Libya, Yemen), and destabilized two governments (in Bahrain, Syria). The Internet made him a historical figure. Apr. 20, 2011 update: In a spirit of healing, the Bouazizi family yesterday dropped its complaint against Fadiya Hamdi and the court has dropped charges against her. . This entry was posted in Analysis, Islam, Reports, Security, Terrorism, War & Conflicts. Bookmark the permalink.